A view in ink of the upper part of the south side of Lincoln Cathedral, and a west view of the palace, taken from the palace garden. The cathedral was consecrated in 1092. It had been built by Bishop Remigius, a Benedictine monk and spiritual guide to William the Conqueror at the Battle of Hastings in 1066. Remigius was repaid for his loyalty by being given the largest diocese in medieval England, stretching from the Humber to the Thames. 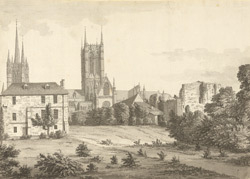 Indeed, the cathedral for this diocese was scheduled to be built at Dorchester, near Oxford, but William moved it to Lincoln because of its strategic position. William had already established a castle here, in the south-west corner of the old Roman city. The cathedral was built of Lincolnshire oolitic limestone.